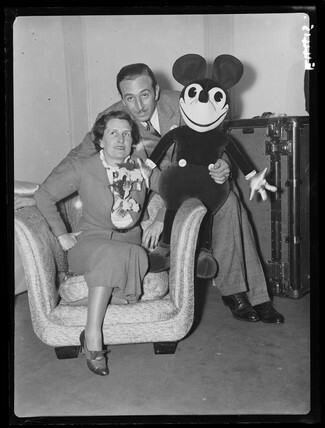 Walt Disney and his wife sitting with a Mickey Mouse doll. Woman ironing in the kitchen, 1 October 1936. Demonstrating the latest x-ray equipment, 7 December 1938. Boy playing with model aeroplanes. Father Christmas at Pontings of Kensington, 24 November 1995. Snowball fight on Hampstead Heath, 27 January 1935. A South Wales coal miner, 28 January 1940. Soldier kising his wife through railings, Second World War, 15 May 1940.